Referencing Charcot's late 19th century photographs of female 'hysterics', the medieval moral phantasmagoria of Bosch & Bruegel and the work of Cindy Sherman, Roxana Halls' A Hysterical Woman employs dark fantasy and sinister humour to offer frozen moments of a mysterious transformation. The work was made, in part, as an attempt to chart and manifest the artist's own experience of depression. Halls has long been fascinated by the grisaille genre, a type of painting executed solely in monochromatic tones used to imitate the inert appearance of stone. Northern Renaissance masters often used this technique when painting the external wings of hinged altarpieces. The use of a limited palette in this context was intended to be directly antithetical to the elaborate, sumptuously coloured interiors. Grisaille panels were sometimes only visible when the altarpieces were closed, generally during lent, a time of reflection and constraint. Today these works are often invisible, with their faces to the wall, as polytychs are displayed open with their more exuberant aspects turned towards the museum visitor. In A Hysterical Woman Halls draws metaphorical parallels between such works and the state of depression: within this state a sufferer often presents a vivid persona to the world whilst concealing another more sombre face. Compositionally, the work describes a woman moving through a process of transformation. Initially, she appears immobile with rage until her body is racked with contortions. She begins to carve, disassemble then consume her own being, then to slowly re-craft herself from what remains. The being who ultimately emerges in the final panel bears no resemblance to the figure from the first. This work presents the viewer with a tableaux of images which seek to convey something of the abject horror, fragmentation and occasional surreal comedy of a depressive episode. It is a savage rejoinder to those who would wish to extract a redemptive narrative out of such an experience. The artist aims only for truth and hopes that it may connect with those who know all too well how this lonely, brutal experience feels. This piece is a complex wooden construction hand made by the artist comprising of 9 individual panels recessed within one larger painted frame, with rectangular holes cut out of its surface in order to create the impression of 9 windows, or 'cells'. The surface of the construction itself is painted to give the illusion of further recesses within the main frame. 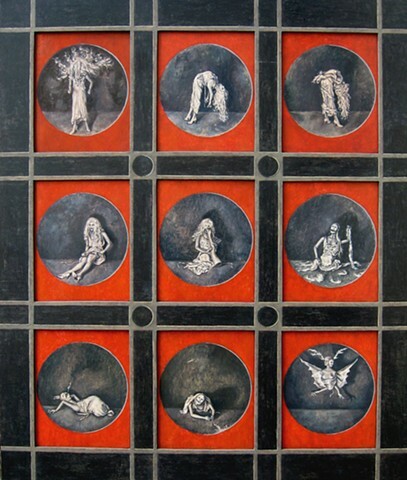 Its execution was intended as a deliberately crude approximation of an early multi-panelled allegorical painting. While Halls has worked with the theme of 'female hysteria' in much of her work it is the only piece of its kind made by the artist.